As in most "gratin" recipes in France, the vegetables tend to be overcooked. It gives a different taste to the cauliflower than the one you get when the florets are just "al dente" but it's easier to feed to the children because it melts in their mouth. If you are feeding younger children, you could puree vegetables taken from the bottom of the pan (so that you don't get much white sauce and cheese). I tend to to that for my younger kid who is not a big fan of cauliflower au gratin (any DNA reason?). Bon Appétit! Broil until golden brown if necessary. I use my pressure cooker to steam the vegetables. It takes less than 5 minutes. 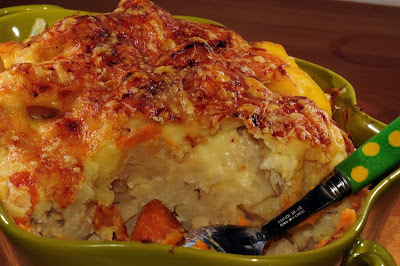 dans ma famille, les enfants aiment ce gratin qui n'est pas sec mais au contraire moelleux , en plus rapide à faire en revenant de son travail le soir . Hey, stumbled on you from Steamy Kitchen--LOVE your site! I'm struggling with getting my kids to eat "real" food, so I will follow with interest! Ohhh. This is exciting. I've never thought of combining the potatoes with the cauliflower like this. I'm excited to try this!